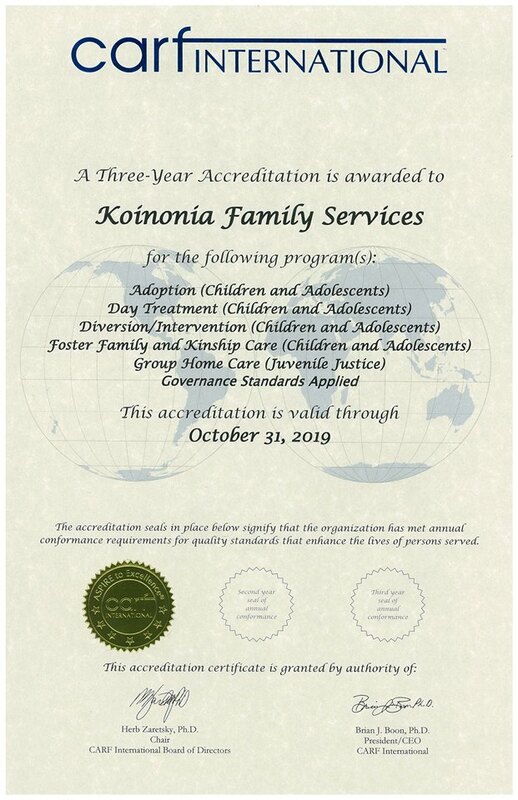 Koinonia Family Services is very proud to have just been awarded the CARF three year accreditation. Agencies are granted accreditation periods ranging from one to three years based on performance, and we are thrilled with the commencement of our three-year award. This achievement underscores our commitment to excellence and quality, as well as our motivation to succeed and improve as we work to help children in need across California and Nevada. Of course, a special thank you is due to our care providers, staff, and stakeholders who met with the CARF team to discuss our organization and services they have received. We truly appreciate the time you took to aid us in achieving this milestone.